This is a beautiful piece! Very sturdy. I love the way the mirror and the brass look - very sophisticated! Transitional with a glam flair, this brass Metropolitan metal bar cart from iNSPIRE Q® Bold is as stylish as it is functional. The uncomplicated lines and antique finish create a classic feel that will match an array of design schemes, while the mirrored glass shelves gives the look a modern touch. Small enough for easy maneuverability, but large enough for pouring and mixing drinks, this convenient bar cart is a hosting essential for any occasion. Love the new bar cart and style it adds to my dining room. Arrived well packaged and undamaged but box is on the heavy side. Not too hard to put together. Seems nice and sturdy. Wheels have no lock. Mirrored glass is lovely but can scratch so be gentle. The glass just lays on top of rubber pegs, so be careful not to tip the cart or it can fall out. Overall very happy with the cart, which has a sophisticated look but is a fraction of the price from other retailers. This cart is stunning. The darker gold/antique color leaves it a little bit understated but then you have the mirrored glass that gives it a glamorous pop. The size is also perfect and it's very sturdy for all of my bottles. 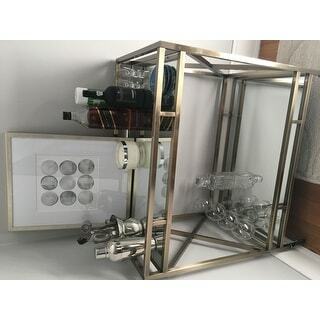 I searched for months for the perfect bar cart and this one meets all of my expectations. 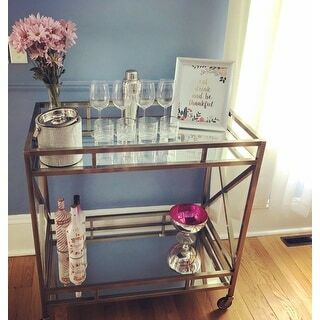 We did a ton of research on bar carts and settled on this particular one due to its large size and color. We found plenty from Crate and Barrel and West Elm but for a fraction of the cost. It looks just like the pictures provided and is beautiful when set up. It is nice that there is so much space between the two shelves allowing someone to decorate with taller vases or even creating different looks with decor of different heights. Color and matte finish just as pictured. Can't wait to have friends over to display this new addition of our dining room. Another total win from Overstock. The cart was easy to put together. It was bigger than I thought it would be which is good. Its Sturdy. when you put it together make sure the holes for the sides are pointing in because thats where the supports for the shelves will be screwed in. I got one of them reversed. Seems to be a high quality product. Very pretty and nice quality. Looks great in my room with my antiques mix of items. Love the reflection of the mirrors it gives extra light. 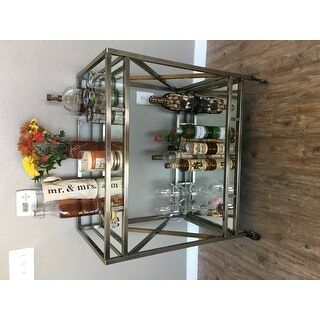 It is difficult enough to find a bar cart that that works for your space, you like, and is cost-efficient, that I felt compelled to review this item. This cart has exceeded my expectation - it is sturdy, arrived in good condition, and looks great. We get many compliments on it, and it is a great size. Also easy to assemble! I looked at a million bar carts!!! We couldn’t be happier than this one. It was super easy to put together. It looks great and is very mobile! Gorgeous!!! I am so happy with this purchase. 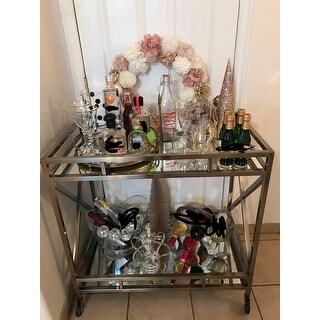 I spent a long time searching for bar carts and I definitely picked the right one. It looks exactly as I expected and even better in person. And so simple to put together! It only took me about 15 minutes. All around a great purchase! This cart is a great size. It is even more beautiful in person. It's not too trendy and feels almost timeless. It was a terrific addition to my client's dining room. Great deal! This is beautiful. Unfortunately did not fit in my space. Great value! As usual quick delivery! 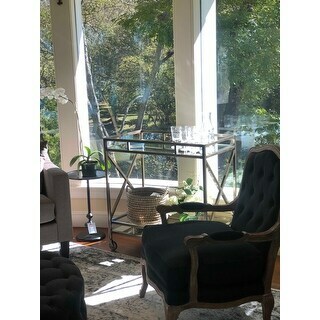 My sister just bought a new house and was online looking at tea carts and I steered her to look at O for one and we decided this would look perfect. She said it was easy to out together and she is very pleased with it. This cart is beautiful! It was very easy to put together and is a perfect addition to our apartment. It’s a great color if you are in-between silver and gold. Love the modern clean look and the simplicity. Have received many compliments. Also is very sturdy and easy to put together. This fits our bar area perfectly. I love the color and easy to assemble! The reviews were good. It was on sale. It matches my etagere. And I was in the market for just this! "do the wheels/casters have locks/brakes?" No, the wheels don't lock. "How deep is the cart? I’m trying to determine if I have this sitting against the wall how far will it stick out?" This item measures 34.3 inches long x 19.7 inches wide x 35 inches high.